with account facilities available to regular trade customers, we offer a quick low cost delivery service throughout the Mid Cornwall area & will always deliver to a wider area if possible. 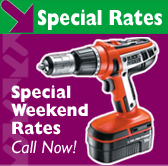 our best rates. Our workshop is at your disposal for servicing & repair work all at reasonable cost. 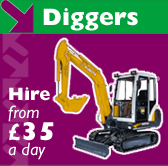 We try to offer the best available to our hire customers & our hire fleet contains Takeuchi & Kobuta Diggers, Thwaites Dumpers, Bomag Rollers, Wacker & Belle Compactors, Bosch Breakers & Powertools, Makita Disc Cutters, Camon & Gardenmaster Cultivators & Turf Cutters, Mace Bumpa Hoists,Imer Scaffold Hoists, Youngman Boss Towers, Lyte Ladders & Staging, Spit & Paslode Nail Guns & Fixings, Earlex Wallpaper Strippers, Ebac Dehumidifiers, Harrington Generators, Hiretech Floor Sanders, Nilfisk Alto Pressure Washers & Steam Cleaners, Karcher Carpet Cleaners and a good selection of Mowers, Cat scanners, Pipe Freezer Kits, Rubbish Chutes and for your events; Gazebos, Chairs, Tables and Barbecues.